The Oklahoma State Regents for Higher Education (OSRHE) and the Oklahoma College Assistance Program (OCAP) are offering a free online tool to help counselors better assist their high school seniors to successfully complete the FAFSA (Free Application for Federal Student Aid). The Oklahoma FAFSA Data Portal (OK-FDP) allows counselors, principals and mentors to provide more targeted assistance to their students, which is instrumental in increasing FAFSA completion rates—especially among first-generation students pursuing postsecondary education. After the school district Superintendent/School Board President/Chief Executive has completed and signed the FAFSA Completion Agreement with OSRHE/OCAP, authorized individuals from Oklahoma school districts will have access to student-level information on FAFSA completion status. 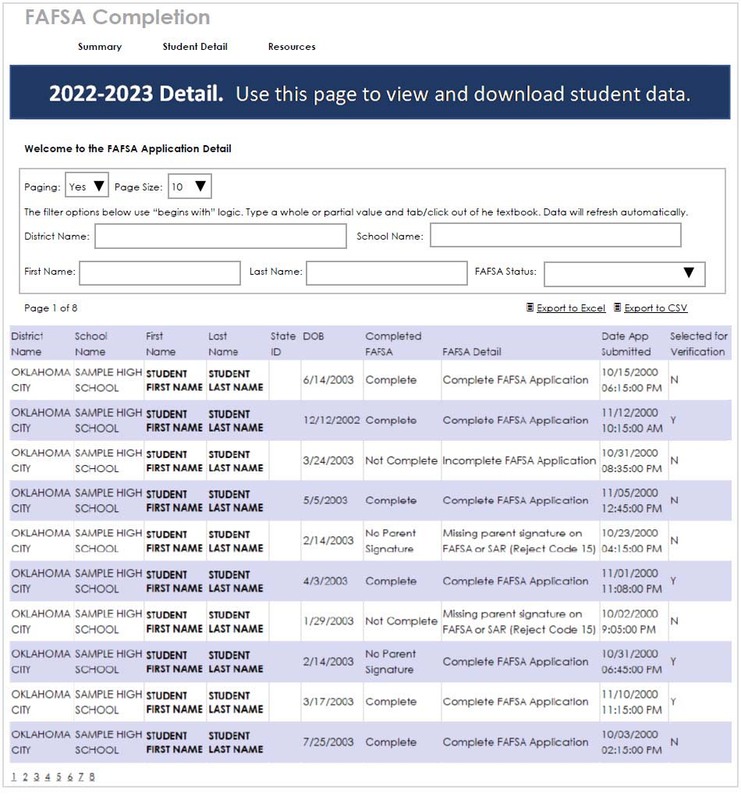 By submitting specific demographic data on high school seniors, users will be able to view each student’s name, date of birth, FAFSA status, date the FAFSA was submitted and a verification indicator as permitted by the Federal Student Aid office. FAFSA data will be downloaded and provided to users on a weekly basis in the format shown below. To learn more and participate in the OK-FDP, visit the OK-FDP home page.